This past weekend, in our first rehearsal (Saturday), we used the script that I made up of Kelly and Shaun’s conversation from a previous rehearsal. I wanted to create some movement with these words, but I didn’t exactly know what the process would be. Perhaps this is a backward way of working in devising—at least its not how we usually work—and I think that was a little frustrating to the rest of the people who were working, but I don’t see any harm in trying it. So I typed up the text, and the first thing we did was have two people who are not Shaun and Kelly just read the text. Hilary-Ann and Chelsea did this. The first read through was funny. Kelly and Shaun were laughing at themselves and could not believe some of the things that they had said to each other. They said that it was weird hearing their own words because they judged themselves and they had to hear over and over things they regretted saying, or thought sounded ridiculous after hearing someone else say it. We concluded that this is a very difficult text to work with. Its heavy, but I think it’s important because I think it’s a conversation that many people have in relationships. So we worked through the text in different ways. Hilary-Ann and Chelsea read it again. Then I asked them to start moving. Ian and I read the text while they moved to it, almost as if the text were music. They seemed to have a hard time with this. We then decided to have Kelly and Shaun move to the text, since they knew it better, as they were the ones who created it. The movements were interesting to watch. They talked about how they were sometimes unsure of when they were pushing and when they were pulling. We had them move in a few different ways, while other people read the text. Sometimes they were not allowed to touch or use objects; sometimes they could only use each other. Then we had them switch places with they other person. So the text that they were “speaking,” though it was still being read for them, was the other person’s. This created some very interesting movement. From there, I took the movements that spoke to me and we started putting that together into a little routine. We got about half way through this routine. We will finish it in our next rehearsal. In the rehearsal the day after that (Sunday), we worked with Hilary-Ann. We went back to some previous work that we had done with the masks and talked about a situation that would make her mask uncomfortable. It was decided that this would be a situation in which someone was trying to delve deeper into understanding her. For this activity, she and Kelly just sat and talked and Kelly was meant to tell Hilary-Ann something very personal about herself in order to get Hilary-Ann to do the same. It ended up being what I think to be a very philosophical conversation that we can use and continue to work off of. I am currently making another script out of their words, and I would like to use it as a possible text under some movement that we have previously devised. These sections that we have been working on recently are so exciting to me. Everyone has been really giving of themselves, which makes the work so much better. After we talked about the conversation that Kelly and Hilary-Ann had, Hilary-Ann wanted to talk about our “masks.” These are things that we’ve been using to describe or visualize walls that we put up in order for people to not see a weakness that we have, or something that we don’t like about ourselves. Hilary-Ann wrote them out in the form of an objective. Here is a photo of them written out. I don’t think it’s a coincidence that these needs are pretty similar. I suppose it could seem that we’ve strayed from the original question of what love means in different cultures, but I don’t think we have. 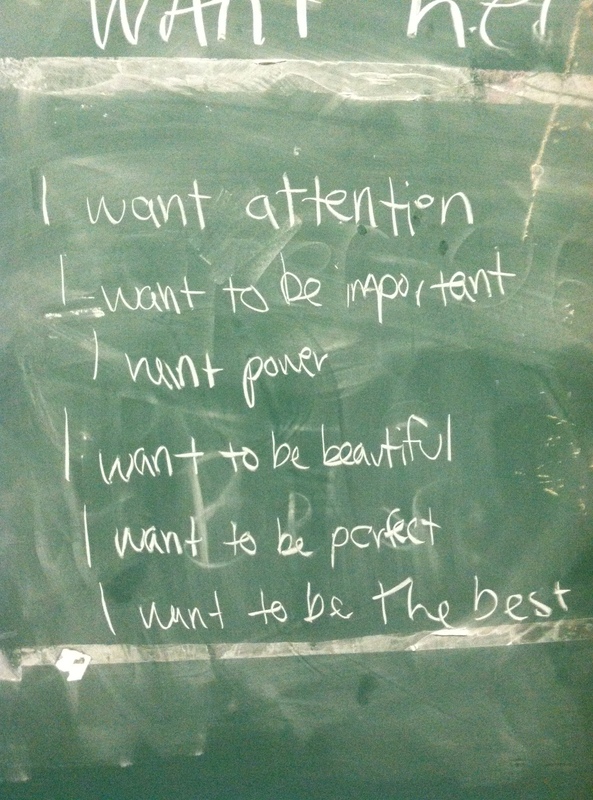 I think all of these huge wants that, for the most part, are unachievable are a product of our culture. And how do we show these needs, or attempt to obtain them? Through our relationships, whatever they may be. I’d say we’re right on target.